Home › Read Journals › What do you guys think? Should we vaccinate our furry babies or not? What do you guys think? Should we vaccinate our furry babies or not? This is the first time I am writing anything ever. But wanted to do it for so long, but was not confident enough if my content will be good enough for people to read.Feel free to share your expertise. So, I got an email from my vet some two days back about the canine influenza thats been going on in LA for quite sometime. I went to vet and got Marcus vaccinated. But what do you guys think? Should we vaccinate or not? I came across so many debates on people saying if we vaccinate every now and then, it might make the immune system weak. Is it true? What do you guys think? Please share your thoughts. This is my first journal or you can say very first time that I am writing something publicly. This journal will mostly focus on my day to day life(work, personal). I have a two year old dog and I love him a lot. He is my life. So, yes you will see lot of stuff around him along with videos, pictures. 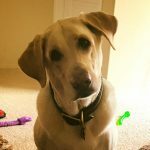 I also read some stuff online for dogs and will share it here so that you guys can share your opinion on the same. Also, please feel free to suggest writing tips since this is my first time. Thank you!! Feels good to get a reply on my first post. Thank you! !